Note: My Workforce Analyzer is available to Sage HRMS or Sage Abra Suite customers using both HR and Payroll products. Contact us for pricing or more details. - Gross-up Calculator - Calculate the gross amount of money that you need to pay in order for an employee to receive a predetermined net amount. - Improved Reporting Functionality - Sage HRMS now includes SAP® Crystal Reports 2011 for designing and delivering powerful, flexible reports. - Microsoft Windows Internet Explorer 11 and the Microsoft Windows 8.1 OS are now supported by Sage HRMS and Sage Employee Self Service 2015. 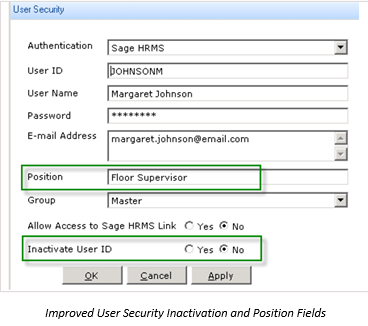 Contact us for the Sage HRMS 2015 Release Notes or to discuss an upgrade.